Ovarian Psycos in the LA TIMES! – O.V.A.S. Ovarian Psycos in the LA TIMES! Growing up, Evelyn Martinez’s mother didn’t want her to ride a bike. “She thinks it’s not safe for women to be riding late at night, and cars are dangerous too,” Martinez said. 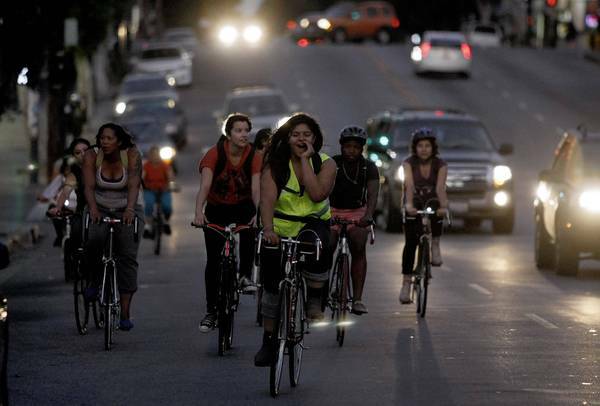 But after a chance meeting last year, Martinez joined an all-female, predominantly Latino cycling group that is both an answer and a challenge to the aggressive male biking culture. Like men’s bike crews, it defies L.A.’s monolithic car culture with an in-your-face ethic, reflected in its name: the Ovarian Psyco Cycles Brigade. to read the rest of the story, click here: HERE! Next PostNext “Ovarian Psyco Cycles’ Bike Brigade Is the Best Thing Ever” – according to JEZEBEL!